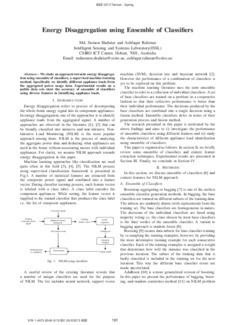 We study an approach towards energy disaggregation using ensemble of classifiers, a supervised machine learning method. Specifically we identify different appliance loads from the aggregated power usage data. Experimental results on a public data sets show the accuracy of ensemble of classifiers using diverse features in identifying appliance loads.